This month, Dental Hygienist Liz Belringer will be on board to offer advice and look at any problems, and will be able to fast track boaters to an emergency dentist. There will be free toothbrushes and toothpaste. 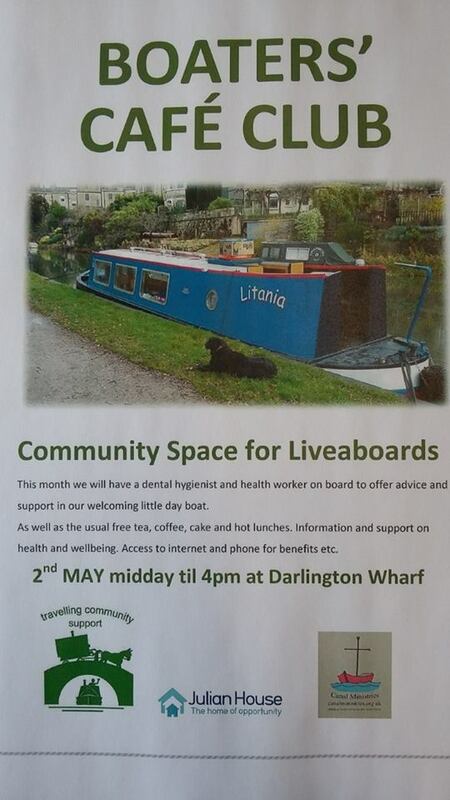 A health worker will be on board, plus refreshments, hot food, internet access and phone, support and advice from Julian House and Canal Ministries. Health packs and emergency food parcels will also be available for anyone who needs them. For those who want to vote in the General Election on June 8th, Julian House is hoping to have voter registration forms on the outreach boat this time. The outreach boat goes out on the first Tuesday of the month to easily accessible places on the canal within BaNES and Wiltshire. This entry was posted on Sunday, April 30th, 2017 at 4:05 pm	and is filed under Health, News. You can follow any responses to this entry through the RSS 2.0 feed. You can skip to the end and leave a response. Pinging is currently not allowed.